... Like Moses, in the loneliness of mountain Horeb, he conducted his flock in the most secret places of the desert, and there saw the flaming bush and heard the Voice that spoke and from the Voice he learned the unutterable and Saint Name of God, thus also the monk goes into the desert of silence and perfect loneliness to find God. 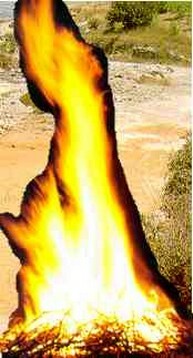 There he finds the "flaming bush" - his own spirit - that burns of the fire of God, without ever be consumed ... God is the Living God, that burns like an intangible flame in the substance of ours own spirit that draws life from Him. Only the souls that burn of divine fire could know this God. The Flame of God is the same Flame of life, of Infinite Being, of Absolute Reality. Only those that have abandoned every lie, every illusion, every deception and all that is not real, they know Him. But moreover, they shall abandon themselves. And getting out from there by themselves, they become more completely themselves, not anymore in themselves, but in Him the voice that they hear is not anymore the voice of a philosophical intuition, not anymore the echo of words from divine revelation, but the same substance of Reality, Reality not like a concept, but like a Person: "I am who I am." "And you, whoever you are, who lives in loneliness and lives hermitic or cenobitic life, as you will have picked up the sheep of your simple thoughts and humble affections in the intimate secret of your pious intention, you will see immediately lighting up, by divine shine, the bush of your poverty that up to now has only given you troubles and thorns; and you will begin to glorify and carry God in your heart and in your body. He is in fact that divine fire that doesn't burn, but lights up - doesn't consume, but shines... and the bush that burns and doesn't burn is the human nature that burns into fire of divine love, yet staying upright and unharmed.